Jeff Burke's Saint Gaudens Quest New! Learning more about Saint-Gaudens double eagles has sparked the bibliophile in me! My ongoing fascination with Saint-Gaudens double eagles (SGDE) started with reading books about the 1933 double eagle. I had the privilege of seeing the 1933 Farouk double eagle specimen at the New-York Historical Society in August 2013 (see my “Star of the Show: A 1933 Double Eagle,” in The Nebraska Numismatic Association Journal, vol. 57, issue 4 (October/November/December 2013), pp. 16-19, for more details). Curious to learn more about these fabled coins, I read Selling America’s Rarest Coin: The 1933 Double Eagle, David Alexander, 2002; Illegal Tender: Gold, Greed and the Mystery of the Lost 1933 Double Eagle, David Tripp, 2004; Double Eagle: The Epic Story of the World’s Most Valuable Coin, Alison Frankel, 2006; and Striking Change: The Great Artistic Collaboration of Theodore Roosevelt and Augustus Saint-Gaudens, Michael F. Moran, 2007. I also devoured A Handbook of 20th-Century United States Gold Coins: 1907-1933, David W. Akers, 2008; A Guidebook of Double Eagle Gold Coins, Q. David Bowers, 2004; Renaissance of American Coinage: 1905-1908, Roger Burdette, 2006; and Collecting and Investing Strategies for United States Gold Coins, Jeff Ambio, 2008. Possessing a large disk of Saint-Gaudens gold has always been visually appealing to me. I previously had a 1922-S PCGS MS 63 double eagle and a 1910-D NGC MS 64 double eagle in my collection. I traded these double eagles for other coins and hadn’t owned a Saint-Gaudens $20 since 2015. To my surprise, I really missed owning one! Perhaps owning a gold coin makes me feel special. I also love the design. After contemplating the possibilities, I decided to pursue a better date SGDE in a higher grade. My focus narrowed to an examination of 1923-D double eagles: “A choice or gem specimen is usually a treat to behold, the very definition of eye appeal!” (David Bowers, in reference to the 1923-D double eagle, A Guidebook of Double Eagle Gold Coins, p. 266). 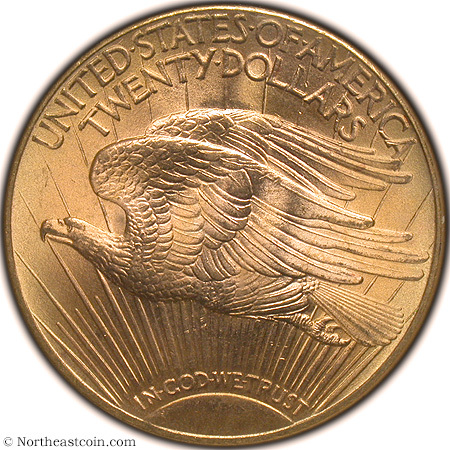 I discovered that 1923- D double eagles are plentiful, but have a much smaller population compared to common date SGDE. 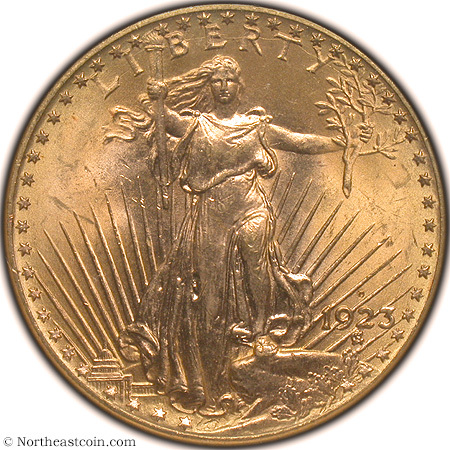 Here is another reason why I chose this particular coin: “...As most examples (1923-D) are boldly struck and show radiant luster, this date (and mintmark) is often chosen to represent the type if just a single coin is desired.” (Jeff Garrett, Description & Analysis for the 1923-D Saint-Gaudens double eagle, NGC Coin Explorer). The next step was to order and read Saint-Gaudens Double Eagles: As Illustrated by the Phillip H. Morse and Steven Duckor Collections, by Roger Burdette, ed. by James L. Halperin and Mark Van Winkle, published by Heritage Auctions in 2018. Despite not having a table of contents or index for quick reference, it was a joy to read! My favorite portions were “Background” about United States International Gold Shipment and the engaging Chapter Six - “Lost and Found - Survival of U.S. Gold Coins.” It took Burdette five years to research this masterpiece and another year to write it. (See Wayne Homren’s review of this volume in The E-Sylum, vol. 21, Number 28, July 15, 2018, for more information). This tome is well worth the money! I learned “...it is estimated that out of 70,290,930 Saint-Gaudens double eagles manufactured between 1907 and 1933, only 2,966,565 coins, or four percent, survive in all states of preservation.” (Burdette, Saint-Gaudens Double Eagles, p. 612). The 1923-D is the last mint marked coin in the Saint-Gaudens $20 series readily available to collectors before surviving populations dwindle and prices escalate. (Burdette, p. 397). The 1923-D saw extensive shipment overseas. “Most pieces seemed to have been preserved in foreign holdings, most likely in Argentina or Brazil (accepted as legal tender), where it was common practice to leave U.S. gold untouched in its original bags.” (Burdette, p. 397). 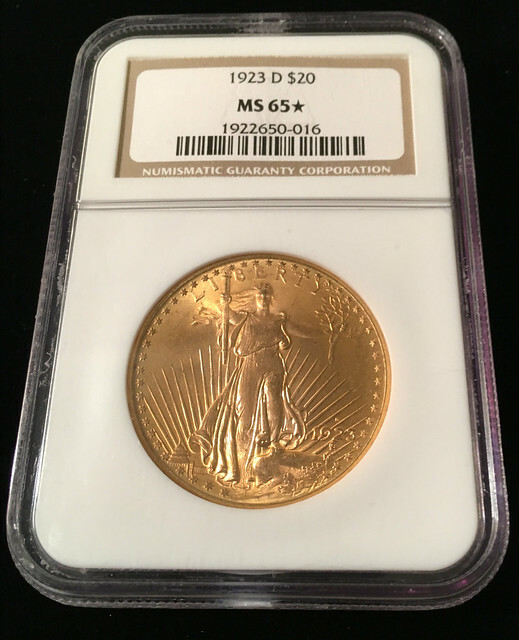 Making the Purchase I worked through my old 2007 list of 31 favorite coin dealer websites and other numismatic websites to examine 45 to 50 specimens of 1923-D double eagles. After perusing numerous dealer websites on the Certified Coin Exchange, e-bay and other sites, I kept returning to a 1923-D NGC MS 65* Star Designation double eagle that I saw on the Northeast Numismatics online inventory. Unfamiliar with the NGC Star notation, I conducted some research. According to the NGC Census as of March 21, a total of 1,389 SGDE are listed with the Star Designation, which is 0.14% of SGDE graded by NGC. 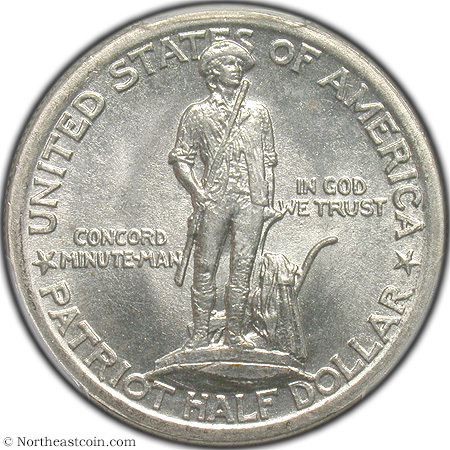 Tom Caldwell founded Northeast Numismatics in Concord, Massachusetts, in 1964. “Tom is a firm believer that an educated collector is necessary to a strong and sustainable coin market, and has taken great efforts to teach youngsters (and elders) the essentials of coin collecting.” (Northeastcoin.com). Providing numismatic education can help collectors learn more about their collecting interests and encourage others to explore the wonders of our hobby. I am thrilled to own this beautiful coin! Did it spend decades in Brazil or Argentina? I wanted to keep this 1923-D double eagle next to me forever so I could admire it at my leisure. Reluctantly, I put it in a bank safe deposit box for safekeeping. Note: Chris Clements of Northeast Numismatics kindly provided obverse and reverse images of my double eagle to accompany this article. Thanks also to Paul Sandler for fielding my questions about Saint-Gaudens double eagle NGC Star Designation coins. It’s hard to feel any more patriotic than today, which is Patriots' Day here in Massachusetts. Right here in Concord Center is not too far away from where it all started in 1775 with the “shot heard round the world,” which was the start of the American Revolution. From our office window we have a birds-eye view of the annual celebratory parade. Minuteman groups along with marching bands, scout groups and more make their way along the parade route while thousands of visitors who have come from near and far, watch and celebrate the spectacle. Speaking of history, the Caldwell family has a long history of involvement in the festivities. Back in the 1960’s I used to march in the parade as a Boy Scout. As the Bicentennial approached, my parents joined the local Minuteman group and also marched in the Concord parade. Later, my two children marched while they were involved in the Scouts. About halfway through the parade route is the Old North Bridge, at which you’ll find Daniel Chester French’s Minuteman statue. 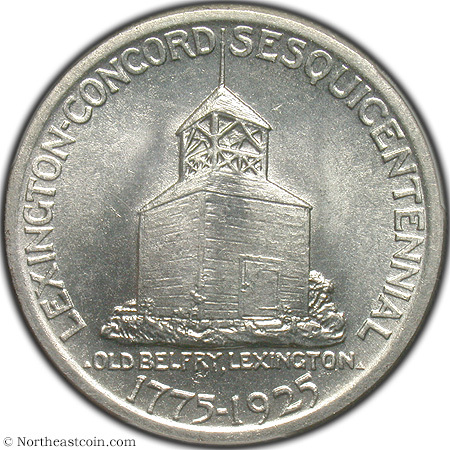 This statue is memorialized on the Concord-Lexington Silver Commemorative Half Dollar (see below). The parade makes a ceremonial stop for speeches as well as a crowd favorite - the reenactment of the famous battle between the British and Colonists at the bridge. Back in the day as a kid, never would I have thought Concord would become home to my family as well as Northeast Numismatics. Happy Patriots' Day! I enjoyed your piece, Tom. Excellent! Glad you enjoyed it. Northeast acquires another 1943 Copper New! After placing a 1943 Copper Cent (PCGS XF45) last year with a customer of ours, we picked up this discovery piece (NGC AU53) earlier this year. The following is an article that appeared in the recent CPG Coin & Currency Market Review. Click the link below the blurb to read the article in its entirety. Want List Dreams Can Come True! New! We have a wonderful customer named Paul from right here in Massachusetts that we have been doing business with for the last couple of years. Paul is 92 and is a spry, fiery sort. We all love him here at Northeast and hope he lives well into his 100's. Paul has been collecting for just shy of 75 years and has built an impressive collection of Lincolns, Flying Eagle Cents, Walkers and Mercury Dimes, among other types. Actually, Paul completed his Walking Liberty Half Dollar set with us. A few months ago, after purchasing a 1942/41-D Mercury Dime from us, he proudly mentioned that he then needed only one coin to complete the set - the elusive key date 1916-D. We did have one at the time, but unfortunately for Paul it was Mint State and as you can imagine just a bit outside the range with which he was comfortable paying. He asked if we could try and locate one in Fine condition. With that, we added Paul's wish to our want list and sure enough, Tom from our office found just such a coin later that week. 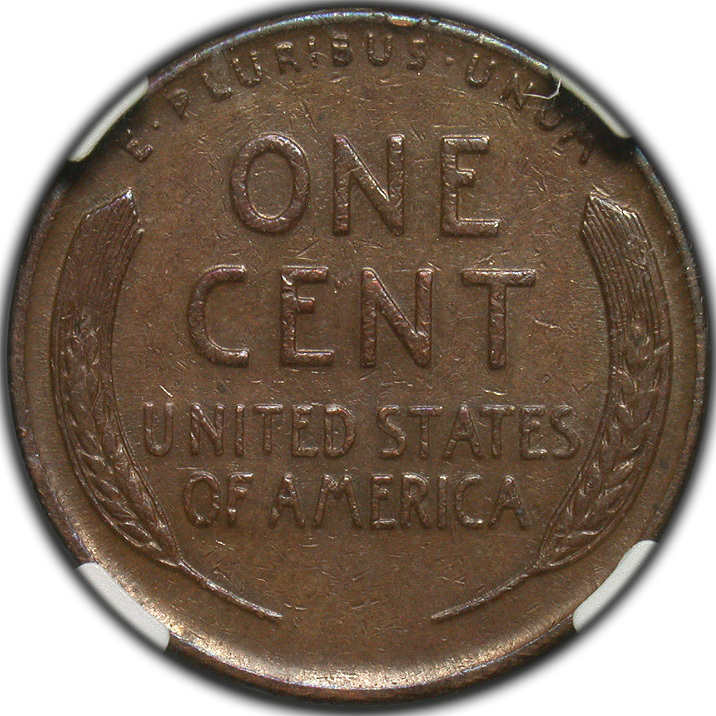 I called Paul and he said that he hadn’t been feeling so good lately, although he did seem to perk up when I gave him the news that we had located a 1916-D Mercury Dime NGC F12. Paul said that if he "makes it through the night" then he would call us the next day. Sure enough, we got the call the following morning and Paul was feeling markedly better and that he was ready to buy the coin and finally complete his set. He sounded like he was beaming at the prospect of finally reaching this life-long numismatic goal. We all like stories that have a happy ending like this one, but remember, you don't have to be 92 and on your last coin in order to give us your want list. Perhaps we can make it happen for you whether you're just starting out or finishing up your collection. Grading seminar in Manchester, NH New! Several months ago, Ernie Botte from EBW Enterprises, who conducts very successful monthly local shows in New England, asked me if I would be interested in conducting a one-day coin grading seminar at his semi-annual regional November show in Manchester, New Hampshire. Unfortunately, the reason Ernie was asking was that Charles Browne, who would normally have done the seminar, passed away earlier this year after a long and courageous battle with cancer. We knew Charlie as a friend, fellow coin dealer, and all-around good guy for over 40 years. We grew up in the business together. He was known for generously providing his time to the annual ANA grading seminar in Colorado Springs every summer. Charlie worked for a time at PCGS as a grader and he dealt in coins, working for several dealers and himself throughout the years. A friend and mentor to many, Charlie always had a smile and a kind word. He is dearly missed by all. In his honor, the ANA has set up a program to raise funds for a scholarship for a young numismatist for every year of Charlie’s volunteer years of service. Please click here to learn more. Having been in the business for over 50 years, I know how to grade coins. We do it every day as we evaluate and purchase raw coins in collections and spend tens of thousands of dollars annually in grading fees at the third-party grading services. In order to make good buying decisions, we need to know what we are looking at when viewing raw and certified coins alike. However, having never been a teacher, the prospect of running a class was a little intimidating to say the least. Agreeing to do so, I partnered with Dave Pepi from Pilgrim Coin to conduct a 90-minute class on the last day of the show. The 20 or so students that awaited ranged from a 12-year-old whose birthday was that day and had asked specifically to attend this class as a gift with his dad, to a couple of local vest pocket dealers, including retirees looking to expand on their grading skills. Starting in the early 20th century, grading was strictly adjectival and primarily used only Good, Fine, Extremely fine, and Uncirculated. Numerical grading then came into play when Dr. William Sheldon came up with the 1 to 70 scale in 1948, for usage primarily with large cents. In the 1960’s more intermediate adjective grades were added and came into common usage. Only in the mid 1970’s did numerical grading start to become popular. This was largely value driven. As prices were increasing, and collecting and numismatic investing became more popular, the need to further pin point grades became necessary. This was the era when the first grading service started. ANACS, which was owned by the parent organization the American Numismatic Association, started in the mid 1970’s with paper certificates showing black and white photos of the obverse and reverse of the coins. Next, NCI improved on this concept in the early 80’s with color certificates. 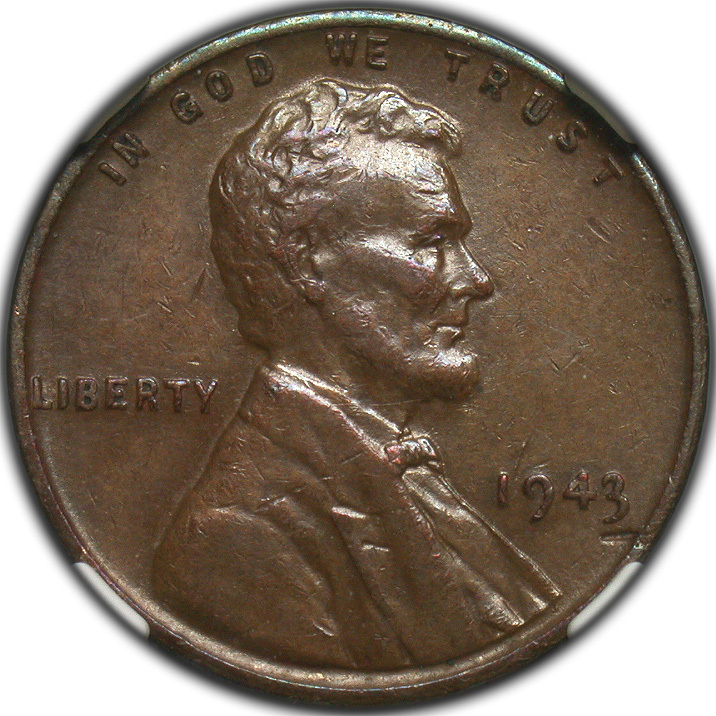 At this time both ANACS and NCI had split grades; meaning the obverse could be MS63 and reverse MS64. Then in early 1986, PCGS started up with NGC following in mid-1987. With the innovation of these grading services we finally had our encapsulated grading services that we depend on and universally use to this day. Other interim grades such as XF45 and AU53 were added into the lingo and became commonly used. Later, plus signs and stars on grading inserts were sometimes used for coins when deemed appropriate. Again, this was largely value driven and used for coins that were exceptional. By this point in the seminar the students had heard enough about the history of grading and were more than ready to get down to business. Making sure everyone had a suitable magnifier (our Northeast magnifier was handed out to anyone in need), forty certified coins were chosen from our inventory. We then placed stickers over the grades on the holders and had the eager students split up into four groups. Ten coins and a list were provided to each group to review. Dave and I then roamed around and observed their grading techniques. They were first instructed on how to properly use a magnifier. Then they learned about tipping the coin as you view it in order to take the strike and luster into consideration. Does the coin have bag marks? If so, how does this affect the grade? If the coin is toned, is the toning original? Is it ugly, attractive, or just average and how is this taken into consideration at when a final grade is arrived? Grades were then revealed, and we had a discussion on why X coin was X grade. Next, the groups of coins were exchanged with other students so that each group had the opportunity to grade a total of 20 coins. In the end my pre-seminar notes were little used or even needed. Everyone seemed satisfied with our instruction, with many having picked up some pointers while others were perhaps still more than a bit confused, which is completely understandable. Learning how to become an expert grader does not happen overnight. Emphasis was made on looking at coins to see how they are graded. Go to shows, get confidence in your local dealer, look at auction catalogs, and look at online images (so excellent these days). The more you see, especially in person, the more you will understand about grading.